Not much traffic on newly rebuilt Second Avenue on the afternoon of the 4th of July. On Independence Day, though, the last of the barriers had come down. Second Avenue was open again from Washington Street to Ellsworth. The only thing left was to apply the stripes and other pavement markings. 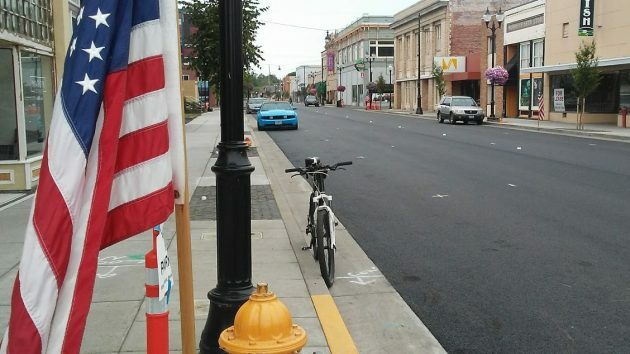 Back in April, the city council and others on the advisory board of the Central Albany Revitalization Area decided to spring for a full reconstruction of seven blocks of Second and Third avenues, rather than a less thorough repaving job. This added $444,000 to the cost of the city’s “streetscape” contract of $7,637,700, the CARA board was told at the time. The job called for seven inches of asphalt over a 12-inch layer of rock. The new streets now are expected to be in good shape for at least 20 years. Also as part of the job, the center crown of these streets was flattened. Thank goodness there are now nice streets downtown to go with the buildings that some of the owners don’t take care of. When are the owners of said buildings going to be held accountable so downtown vitalization can actually be reached? Tell me this. Why did they waste all that money digging it up, adding seven inches of asphalt over a 12-inch layer of rock. They say it will only last 20 years. The old road was there at least 24 years. That’s how long I’ve lived in Albany and the road hasn’t been paved in that time. They could have ground up 3 or 4 inches and repaved. It would have cost much less and probably last the same 20 years. The biggest issue I have is 6 months from now someone will come along and dig it up again for whatever reason, do a crappy job filling it back in and the road will be just as bad as before. I agree it all looks nice but I think it’s a big waste of money. The intersection of Albany pavement with ODOT pavement begs the question: why didn’t the City coordinate with ODOT so that the entire roadway could be fait accompli? Perhaps City Moms and Pops thought that spending the money now would provide leverage in squeezing ODOT to move along any faster than it typically does. For now, Albanians should prepare for the inevitability of ODOT finally coming around, adopting the grand CARA dream as their own. ODOT will be paving Lyon and Ellsworth (U.S. Highway 20) from First to Ninth avenues later this summer. Hope the water on the streets drain properly during a heavy rain. Hasso: Pretty smooth ride for you…no one on the road but you, except for people coming and going from Corvallis.. Where are all the tourists here to ride the Carousel on the 4th of July??? Oh, you say they didn’t show up in predicted hordes? Well never mind; CARA will keep on spending anyway.